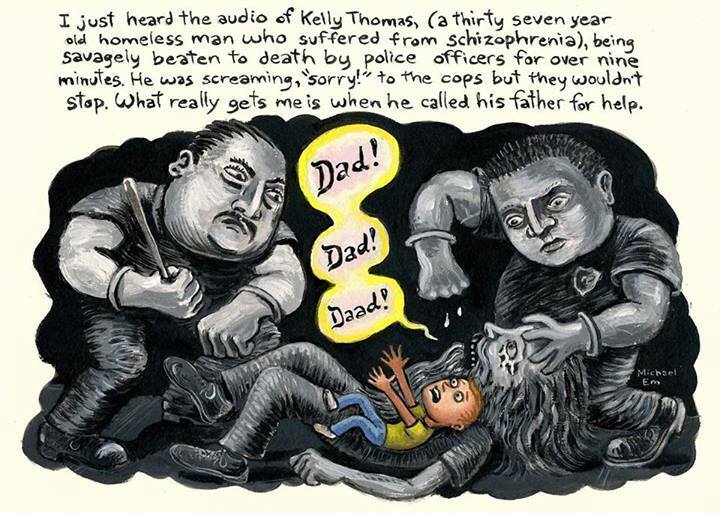 “Dad, they’re killing me!” cried Kelly Thomas as he was beaten in the back of the skull until he was in a coma. “Daaad! Daaad!! Help me please!” were among his last words. If you’re homeless, life can be challenging. If you’re homeless, and mentally ill– it seems you are doubly cursed. When you become a victim, life can be extinguished without prejudice and without recourse. The question must be asked: Wouldn’t an injection of Thorazine been easier than beating him to death? How very sad. I’m sorry to have had to post such a negative account on Brokenbelievers.com. Please forgive me if I offend. I’m certain that there were many other issues involved, but I understand how easily it is to trample on the least among us. I agree! Thank you for sharing, Bryan. Demonic. When Satan rules in hearts this is what we get. I am so thankful that Jesus sees and hears every single thing. I have to take comfort in this life being but a vapor compared to eternity. He has my tears saved up and yours too. God bless.